And she did indeed succeed in following in his footsteps. She earned her Bachelor of Science in Nursing (BSN) degree in Manila and started her health care career in 1995 as a safety and emergency response team leader with Asian Development, where she took care of diplomats and their families. Now as a registered nurse and an active member of Sharp Professional Nurses Network (SPNN) at Sharp Chula Vista in San Diego, she likes that she’s able to take care of patients from the local community and help people heal. Above all, it’s the network of health care professionals and the amazing people Santos has had the pleasure to work with that she credits as her reason for staying at Sharp. It is because of her coworkers at Sharp and her everyday interactions that she loves being a nurse. Malyne has a heart of gold and is very dedicated to the people of Sharp Chula Vista and to people in general. She was always rounding the floors in the middle of the night, discussing the benefits of the union, and gaining members one by one. I admire her. She inspired me to become more active and involved in the union. I am grateful to have her by my side and look up to her! While she finds it frustrating that a lot of nurses still hesitate to join SPNN, she can empathize. She herself had been hesitant to join at first. After familiarizing herself with the negotiations process, she is now one of the leading activists within our union. Santos is one of SPNN’s new Quality Liaisons (QL), a role that allows her to impart what she knows about the importance of unions in the everyday lives of nurses and other health care professionals. 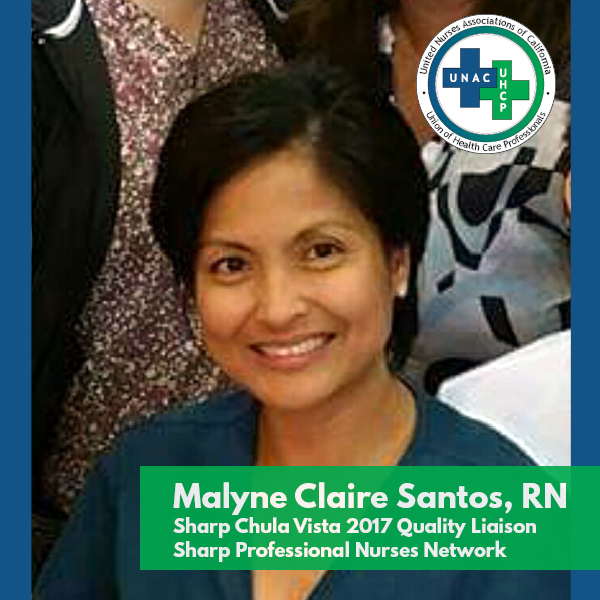 As a QL, she serves as a liaison between RNs and Sharp management in identifying and resolving patient quality of care concerns, workplace and environmental factors impacting care, and staffing. QLs ensure adherence to laws and regulations affecting care delivery and defend our contract. It is especially important to Santos to make sure new nurses at Sharp know the impact that RNs have when they’re able to come together. Those who have not heard of SPNN and the difference our union makes in our workplaces need to hear from those who attended 2016 contract negotiations. While management sowed deception and actively encouraged nurses to not join SPNN, nurses organized and were able to give nurses at Sharp a powerful voice in their working conditions. The future of SPNN is bright with members like RN Malyne Claire Santos leading the way!